Starz is a bit late to the over-the-top arena compared to its premium cable rivals HBO and Showtime, but the company is making up for its tardiness with a new service featuring a perk that the other two don't have: the ability to download content. That will be a big feature of Starz's new stand-alone subscription app, which will give users access to Starz's original series like Outlander, Power and Ash vs Evil Dead, plus movies like Avengers: Age of Ultron and (later this year) Star Wars: The Force Awakens—all through the internet without a cable or satellite subscription. The service is available on Android and iOS and will cost $8.99 per month, which is $2 cheaper than Showtime's OTT service (though Showtime offers an $8.99 per month add-on option for Hulu subscribers) and $6 less than HBO Now. And Starz is offering quite the incentive to subscribe immediately: early access to the Season 2 premiere of Outlander, which will be available on the service beginning April 7, two days before its linear premiere on Starz. Stand-alone subscribers—and Starz's current subscribers, who will also have free authenticated access to the app—will have the ability to download content to their devices and view them without having to stream it through a Wi-Fi or cellular network, a feature that the HBO Now and Showtime apps currently lack (however, Amazon Prime introduced this downloading option late last year). 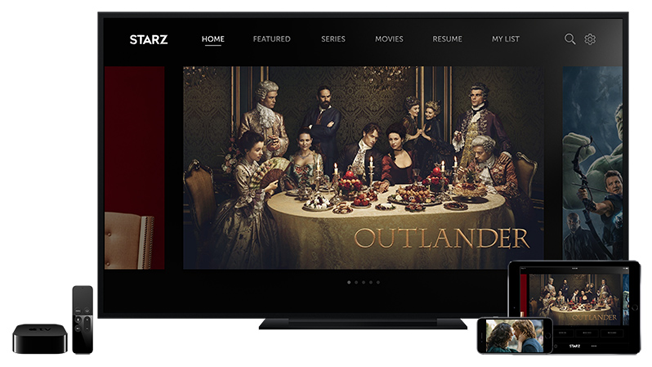 Up to four users can access Starz's app simultaneously, with unlimited downloads. While the app does not offer the ability to livesteam Starz's linear network as Showtime users are able to do, users can livestream the channel via Starz.com. "Our programing will now be more widely available to the 20 million broadband-only homes of cord nevers, cord cutters and cord shavers, including millennials and other underserved consumers who need other viable subscription service options," Starz CEO Chris Albrecht said in a statement. "Showcasing the rebranded Starz offerings we announced last month, we believe this innovative app will also help fortify the broadband business of many of our traditional distributors and be even more appealing for inclusion in future video bundles." While HBO and Showtime were aggressive with their OTT efforts last year—HBO Now launched last April, while Showtime's service went live in July—Albrecht had initially resisted efforts to release a direct-to-consumer offering. In early 2015, he told Adweek he was "probably far away" from considering that option, explaining, "We want to establish our bona fides with our distributors and with our current subscriber base." But by January, Albrecht said Starz had reversed course and was working on a stand-alone service to reach viewers without a cable subscription. What caused his change of heart? "Well, I think when you see so much energy in that world, it seems like these businesses are existing side by side," Albrecht told Adweek in January, referring to cable/satellite providers and over-the-top options like HBO Now, Showtime, Netflix and Hulu. "We want to make sure that if we do it, we're doing it with a really good product and with a strategy that make sense for us, which may be different than the strategy that makes sense for other people. So we're not in any hurry, but at the same time, it seems like there's an inexorable march towards that." In December, Starz dipped its toe in the OTT water by partnering with Amazon to offer the network as an add-on service to Amazon Prime subscribers. Albrecht told Adweek in January that Amazon was "pleased" with the early results of that offering.